"I believe this model to be viable, logically deduced, and no more complicated than it should be for its intended purpose. It offers the armed professional a method of acquiring vital information about the performance of his/her own self-defense ammunition, shot from his/her own handgun, without the expense and complications of full-scale laboratory tests." Q: Under what conditions does the quantitative terminal ballistic model operate? 1. 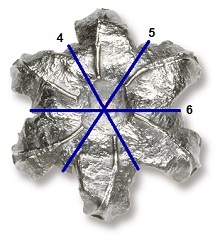 All significant plastic deformation of the projectile occurs within periods of 10-4 seconds. 2. The projectile behaves as a rigid body after expansion ceases (no further ductile or ablative erosion occurs) and exhibits no significant yaw during any portion of the penetration event. 3. The terminal behavior of the projectile is governed by a material strength variable and the inertial and viscous (or frictional) drag losses that occur during the projectile's penetration through the medium. Q: Does the quantitative terminal ballistic model take into account any other property of soft tissue? A: Yes, it does. Besides including a variable for the density of soft tissue, the quantitative model employs a material strength variable within its governing expression that allows for the computational evaluation of any type of soft tissue. Within a confidence interval of 95%, the quantitative model predicts the terminal penetration depth of projectiles in calibrated ordnance gelatin with a margin of error of less than one centimeter. Q: What are the benefits of using water as a medium to test and evaluate the performance of self-defense ammunition? A: Water produces dynamic forces on transient projectiles that are nearly identical to those produced by calibrated ordnance gelatin making it an excellent tissue simulant. Water is insensitive to ambient environmental conditions, requires no calibration in order to produce valid test results, and can be used with little difficulty. Ballistic tests conducted in calibrated ten percent ordnance gelatin require rigorous environmental control to ensure a valid test outcome and can cost in excess of $400 per test shot. Because not everyone has the facilities, or can afford the expense and/or the technical burdens, to conduct testing in calibrated ten percent ordnance gelatin, t﻿he ease of use and low cost of testing in water make it an attractive option for those individuals seeking a valid, cost-effective ballistic test medium. This is important because ammunition designs―even 'premium' JHP designs―are neither static nor unchanging in their construction or composition. Manufacturers are constantly altering―﻿sometimes in some not-so-minor ways―﻿their ammunition designs. Until testing is conducted, there is no way for the end-user to know how the ammunition will perform unless, of course, the end-user is willing to wait for the manufacturer to do so once a new design iteration has been produced. 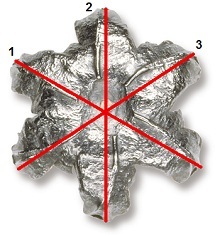 Q: What is the procedure for determining the average expanded diameter of a test bullet? A: The procedure requires the use of a caliper or micrometer capable of making measurements to the nearest thousandth of an inch. An equal number of measurements across the largest widths (#1, #2, and #3, in red, below) and smallest widths (#4, #5, and #6, in blue, below) of the recovered bullet’s expansion face are taken and added together. The sum of the measurements is then divided by the total number of measurements taken (six in the example below) to arrive at the average expanded diameter of the recovered bullet. Q: How is a water test conducted? A: A test projectile is fired over a chronograph through a test barrier (if desired) and into water. Using data obtained from the test﻿, the quantitative model is used to predict the test projectile's maximum terminal penetration depth, permanent wound mass, and permanent wound volume as it would occur in calibrated ten percent ordnance gelatin. From a distance of 15 feet, a Federal Classic Hi-Shok 9mm 115 gr. JHP﻿ (9BP) was fired from a Glock 17 through two layers of 1.66-ounce pure cotton t-shirt fabric into water. * The Federal Classic Hi-Shok 9mm 115 gr. JHP﻿﻿ passed through the two layers of cotton t-shirt fabric﻿ and struck the water test medium at a velocity of 1,156 feet per second where it expanded to an average diameter of 0.636 inch and retained 109.7 grains of its initial 115-grain weight. Applying the test data to the quantitative model yields a predicted maximum terminal penetration depth in calibrated ten percent ordnance gelatin of 9.082 inches and a predicted total permanent wound mass of 1.421 ounces for the Federal Classic Hi-Shok 9mm 115 gr. JHP﻿. Predicted permanent wound volume is 2.364 cubic inches. The US Army BRL probability of incapacitation rating of this test munition is 71.96% for a random single projectile strike to the torso or abdomen. Q: Can the quantitative terminal ballistic model be used to make an accurate comparative assessment of the terminal ballistic performance of projectiles that have been fired into calibrated ten percent ordnance gelatin? A: Yes. As the following examples show, the quantitative model can be used to evaluate the performance of projectiles tested in calibrated ten percent ordnance gelatin. A Glock 19 was used to fire a Hornady TAP-CQ™ 9mm 147 gr. 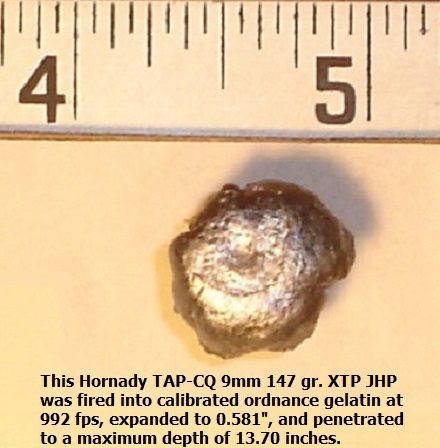 XTP JHP bullet from a distance of 21 feet into bare calibrated (3.10 inches at 585 fps) ten percent ordnance gelatin. The 9mm 147 gr. XTP JHP struck the gelatin test block at a velocity of 992 feet per second, expanded to an average diameter of 0.581 inch, and penetrated to a maximum depth of 13.70 inches. The recovered weight of the JHP was 146.6 gr. ; no significant fragmentation occurred. Using the recovered JHP's average diameter, weight, and impact velocity, the quantitative terminal ballistic model predicts, in strong agreement with the test, that the Hornady TAP-CQ™ 9mm 147 gr. XTP JHP would reach a maximum penetration depth of 13.436 inches and produce a permanent wound cavity volume of 2.918 cubic inches with a corresponding permanent wound mass of 1.754 ounces in calibrated ten percent ordnance gelatin. A one-ounce Brenneke USA Tactical Home Defense® (THD) 12-gauge slug was fired from a Remington 870 12-gauge shotgun into bare calibrated ten percent ordnance gelatin from a distance of ten feet. The 430.8 gr. Brenneke Tactical Home Defense® (THD) slug struck the gelatin test block at a velocity of 1,256.6 feet per second, expanded to an average diameter of 0.888 inch, and penetrated to a maximum depth of 17.75 inches. The recovered weight of the 12-gauge Brenneke Tactical Home Defense® (THD) slug was 419.8 gr. ; no significant fragmentation occurred. Using the recovered Brenneke USA Tactical Home Defense® (THD) 12-gauge slug's average diameter, weight, and impact velocity, the quantitative terminal ballistic model predicts, in strong agreement with the test, that the Brenneke USA Tactical Home Defense® (THD) 12-gauge slug would reach a maximum penetration depth of 17.520 inches and produce a permanent wound cavity volume of 8.888 cubic inches with a corresponding permanent wound mass of 5.343 ounces in calibrated ten percent ordnance gelatin. Q: What about thermal effects? Can a bullet produce enough heat to burn or vaporize soft tissue? A: No, not at any realistic impact velocity. In Chapter 2 of Quantitative Ammunition Selection, the reasons for this are explained in detail and by example. The truth is that no bullet launched from currently available small arms (pistols, shotguns, or rifles) is capable of producing a significant wounding effect through the conversion of the bullet’s kinetic energy into thermal energy. Q: In many action movies, whenever someone is shot their body is often picked up and thrown violently rearward through a nearby wall or plate glass window by the bullet’s impact. Can that really happen? A: No. In Chapter 7 of Quantitative Ammunition Selection, this Hollywood fallacy is disproven using Newton’s third law of motion. While such exaggeration makes for an exciting movie, it is not an accurate depiction of what actually happens when a bullet strikes a person.